My brother, William got this picture on the same day we got the owl pictures. This Bohemian Waxwing is trying to stuff a crab apple down his throat. Also don't forget to guess on my weekly what bird! A fresh new look for a fresh new spring! Spring is coming on, so I made a few changes to my blog, a green background, and a new title picture. I changed a few fonts and other things as well. Please give some feedback! (e.g. if you think the fonts are too hard to read). This morning we woke up to branches hanging low, laden with snow, the ground carpeted, the trees cloaked in white. It had snowed quite a lot, it frosted the trees and stuck to everything. The forest was white and thick. We can usually see straight across to the neighbors house, today all we could see was a wall of white. The stunning beauty quickly drew us outside (resulting in not a whole lot of school getting done) to play and do some birding. The trail through the forest now felt like a tunnel surrounding us. I gasped every time I looked left and right, and licked the snow off the branches. I did some birdwatching and photographing around the feeders while my siblings took a walk. There were a lot of Hoary and Common Redpolls, as well as chickadees. The landscape right now is perfect for photographing, the trees burdened with fresh snow, like a blanket on the evergreens. I was just imagining how a Cardinal on one of the snow covered evergreens would make an amazing picture, or a Purple Finch. William and I headed out back, hoping we might see the Long-eared Owls. We know usually where they are, in a strip of spruce trees separating our property from the neighbors, so we headed there first. Sure enough, out flies one. It flew a short distance into the evergreen stand, where we quietly sneaked up and got our shots. I sat on a chair very near to the finch feeder, where several redpolls were eating. A Downy Woodpecker came to the suet, I stood up and walked closer to it. I love this picture, a chickadee in the light falling snow. This photo is very good, it is completely uncropped, and the lighting is only very slightly changed. This is what I was trying to get the whole time. A bird on the spikes of snow. I really like this picture. This is what the whole forest looked like. No branches, just peculiar wires of snow. Not time for nesting now, eh? It looked like there was ice, but it was actually just slush. Our dog watched us as we photographed the owl. Now for the owl pictures, these are probably the best Long-eared Owl photos I have taken. It getting ready to fly. It flew to a different perch, then I handed the camera over to William. We took turns until my other brother came walking up and it flew. By now, when I am finishing this post, the splendor of the forest is dissipating and it is melting away, so I'm glad I got out there in the morning. Let me know how your morning was, and what birds you are seeing! Thank you Christine H. for this photo!! Can you guess this bird? - Photo by Christine H.
We had a lot of guesses this week! And, BirdBoy, Matthew and Joel got last weeks correct! White-throated Sparrow!! Let's see if we can get as many as last week. Just as I was wondering if the Long-eared Owls would come back this year while I walked out back, armed with camera and binoculars, looking for new year migration birds, I heard a Blue Jay calling. I decided to check it out,something much much bigger emerged and flapped from the evergreen trees, with the Blue Jay screaming right behind it. I right away knew it was the Long-eared Owl, it was too small for the Great-horned, and that was one of it's favorite spots last year. I erupted with joy and tracked it down around the forest, which was very easy, because there was a swarm of Blue Jays, magpies, crows and ravens following it. I managed to get just a few pictures of it. I sat down in the forest and watched as ravens and crows cawed over head. It was very fun as the jays and magpies flitted about teasing the owl. I'm sure it wasn't fun for the owl though. The ravens seemed absolutely massive, the trees rocked when they landed in them. I could here the wing beats above m, quite fascinating. Unfortunately a branch is just in front of it's face, so the pictures aren't very good. Here is a crow or raven atop the spruce trees. I can't tell what these are either from the pictures, crows or ravens. Stay tuned! I'm sure we'll get a lot more pictures of the owls, this is just the beginning. When they start breeding, if they stay here, I'll try and find the nest, and maybe even see some chicks! Some crazy solar flare or something caused some pretty big geomagnetic storm and people have been seeing northern lights all over Canada and into the USA. I believe there were reports as far as northern California. We see Aurora Borealis on occasion, but several days ago I saw the best that I've seen before. Some were directly over head, like emerald curtains dancing in the night. There was even pink and purple, and on the pictures a bit of blue. It was quite a show! I was blown away by the beauty and splendor of it. My parents who used to work in Churchill have seen better. I'm sure it was nice for them to see northern lights a little closer to what they saw up north. The pictures weren't taken by me alone, we took turns. But a lot of them were by me. The blues really come out in this photo. The shutter speed was on 30 seconds, so we had to stay still for 30 seconds if we wanted to be solid in the picture. In this photo I took the picture and ran into my spot, so I am partly transparent, the lights are shining through me. It changed very quickly, sometimes it was very bright but concentrated in spots, sometimes it was a bit dimmer and stretched across the sky. They stretched across the horizen, from right above us to low to the ground, and all the way across the northern sky. Like a snake it wove across the sky. There are some pink in the right side of this picture. This picture was fun. Me and my brother were standing still as the picture was being taken, suddenly, a car turns around the corner. Uh oh. I was counting down. 3... 2... 1... Run! Me and William dashed off the road as the car zoomed by. Halfway on it's way by, the picture stopped, so now there is a light smeared at our feet in this picture, but stopping before the edge of the other side. In my opinion, it looks pretty cool. What do you see in this picture?... Maybe an army of ghosts? And one solid person. We stayed still for about ten seconds, then moved to a different spot, thus, only a shadow of us is caught on the camera. One of my brothers stayed still for the whole picture though, so he is solid all the way through. Aurora Borealis - Ghost army! Here is my Feathers on Friday post. Spring is here!!! Migrants are arriving, eagles, juncos, crows, robins and even Purple Finches. The latest new bird we've found was an American Tree Sparrow! Spring is so exciting. This may be the most birdsong I've heard this year, juncos trilling, woodpeckers drilling, chickadees singing, Robins and Purple Finches as well! And it's official now, it's the first day of Spring! Here's this weeks bird! Can you guess it? William took this picture at his violin teacher's house. I made the picture smaller to make it harder. Leave your guess in the comments below! Trinity, BirdBoy and The Cats and the Birds guessed last weeks correct, a Gray Catbird! A few moments ago I noticed some movement on the deck. The Hoary Redpoll was awake and looking around! It flew off into the trees. I am very happy it survived, as I was not expecting it too. It must be a hardy bird. William made this post, here it is: a flock of Tundra Swans that flew over our house last year. Last weeks was, as Prairie Birder and Neil guessed, A Rusty Blackbird! Well, goodbye winter. The weather for this week is all above 0. The skating rink is done, melted in the heat. Soon enough a flurry of birds will excite every birdwatcher. 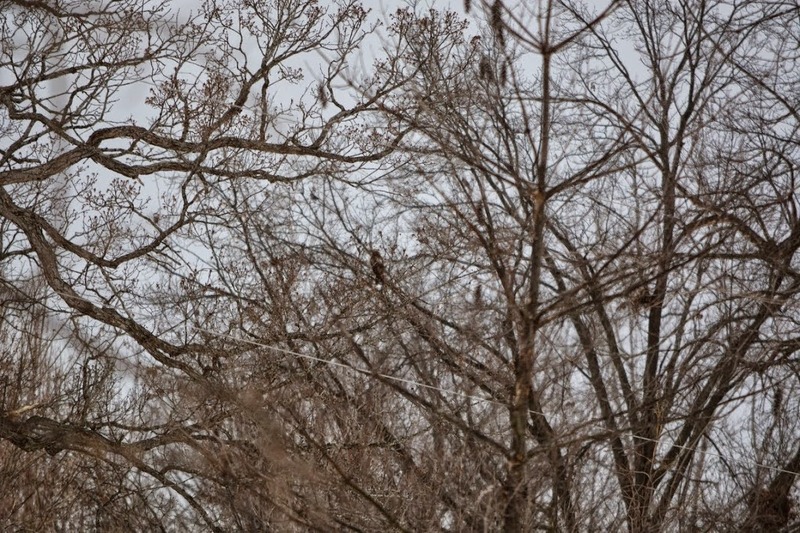 I saw my first Bald Eagle of the day yesterday! I miss their majestic soaring and huge wingspans. As much as I love winter, the miracle of Spring is amazing. Charlotte and William guessed last weeks correctly, Bank Swallow!